Boeing has received a raft of orders from Gulf states eager to capitalise on money received from soaring oil prices. 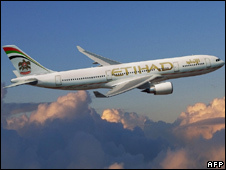 United Arab Emirates carrier Etihad Airways is to buy 35 mid-sized Boeing Dreamliner jets and 10 mid-sized Boeing 777s in a deal worth $9bn (£4.5bn). Meanwhile budget carrier FlyDubai has ordered 54 of the popular 737 planes at the Farnborough International Airshow. The event, where many deals are announced, has also seen Airbus sell eight A330s to Saudi Arabian Airlines. Separately, Mexican carrier, Aero México has signed a contract to buy 12 Embraer 190 jets. Boeing and Airbus - the world's largest plane makers - are hoping that their more fuel efficient aircraft will help attract customers amid rocketing oil prices. The industry faces a tough challenge coping with the soaring cost of jet fuel at the same time as many customers are beginning to tighten their belts and cut back on travel. "For our customers clearly the volatility of fuel price remains a huge issue," said Boeing chief executive Scott Carson. However the high cost of oil - which last week went above $147 a barrel - is providing additional revenue to the producer nations, many of whose carriers are looking to expand their fleets. Meanwhile Etihad, whose new planes will begin to arrive from 2011, has said it expects to announce the purchase of up to 100 aircraft at Farnborough. Canadian manufacturer Bombardier had earlier unveiled plans to launch its C-Series single-aisle passenger plane in 2013, with Lufthansa saying it may be interested in 30 of the more "eco-friendly" aircraft.